Teachers’ Comments: A fine collection of holes, but it didn’t live up to my (lofty) expectations. Harbor Springs is frequently named as one of the Top Twenty Golf Courses In Michigan, but I am not sure it would make my own list. 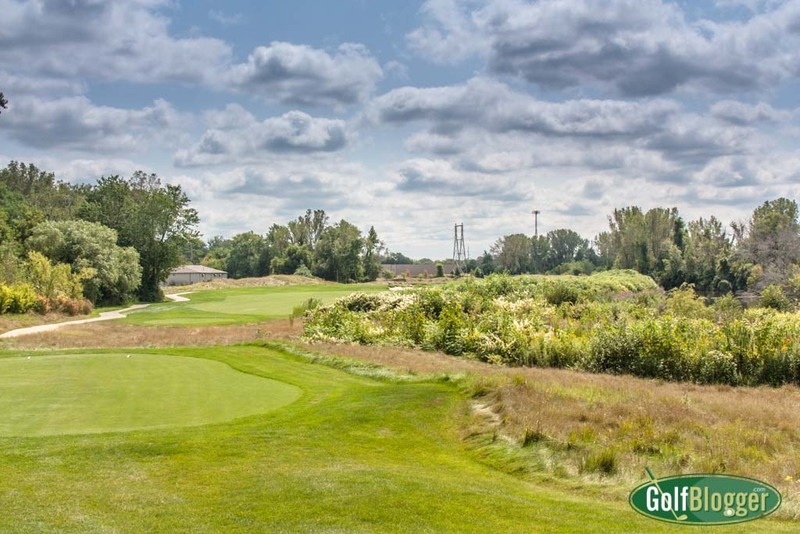 It has the advantage, however, of being the site of the 2012, 2014, 2016 and 2018 PGA Championships (thanks in large part to the sponsorship of Whirlpool, which is based in Benton Harbor). 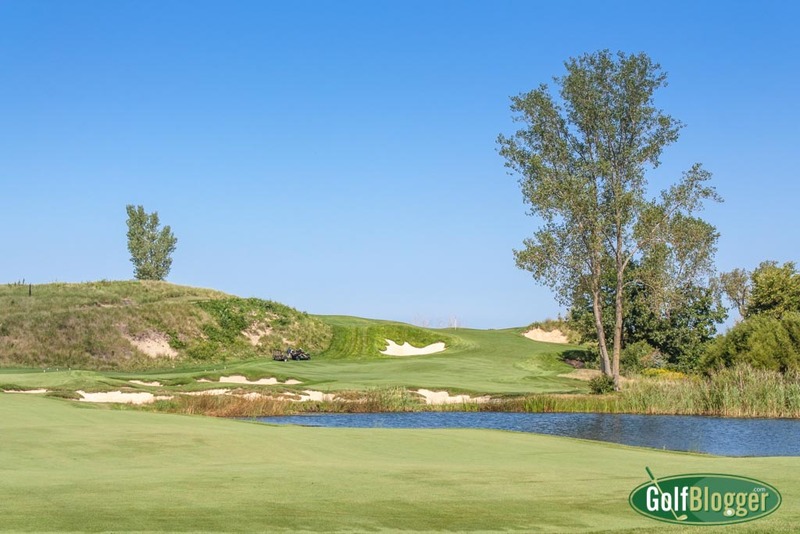 Designed by Jack Nicklaus, Harbor Shores is a real estate development course that plays through marshland along the Paw Paw river near Lake Michigan in Benton Harbor. 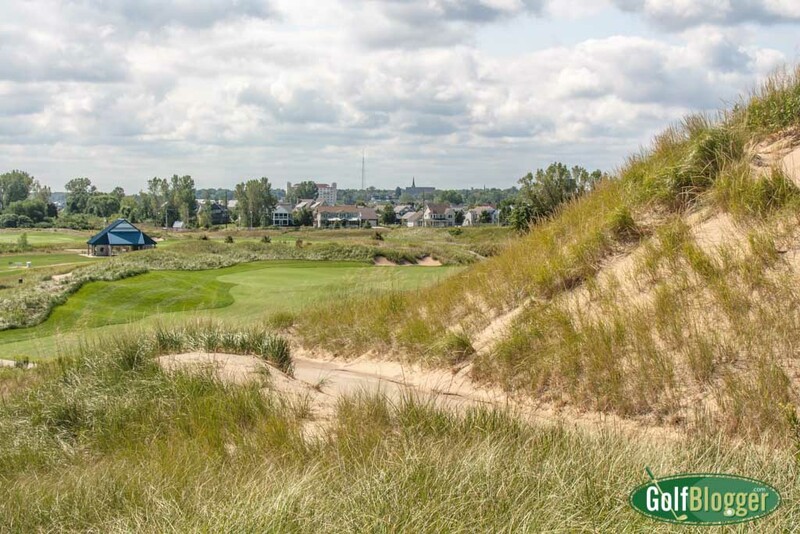 There’s no Harbor, however, and the shores of Lake Michigan are seen on only one hole — the par four seventh. Harbor Shores’ story is interesting. It is a reclamation project that is intended to help revitalize the economically depressed Benton Harbor community. The course and real estate development are built on a “brownfield” left when various factories abandoned the community. More than three million square feet of distressed buildings were removed, and 140,000 tons of waste was removed from the property. The fourth and fifth holes are built on a slag pit left over from an automotive brake company. Fourteen and fifteen are on a Superfund toxic waste site created by a company that used radium and mercury to make fighter plane parts. Profits are funneled back to the community for training and educational programs. A portion of greens fees from Harbor Shores are used to maintain public areas in the adjacent Jean Klock park and its 12 mile walking system. The Jean Klock park was the subject of a lawsuit that ended up in the Michigan Supreme Court. Several of the holes are built on land that was left to the people of Benton Harbor for public use. Interestingly, Harbor Shores is not Jack Nicklaus’ first “superfund” reclamation project. The TPC Dearborn, also built on previously toxic land, is a Nicklaus design. The piecemeal acquisition of parcels of land is reflected in Harbor Shores’s routing. 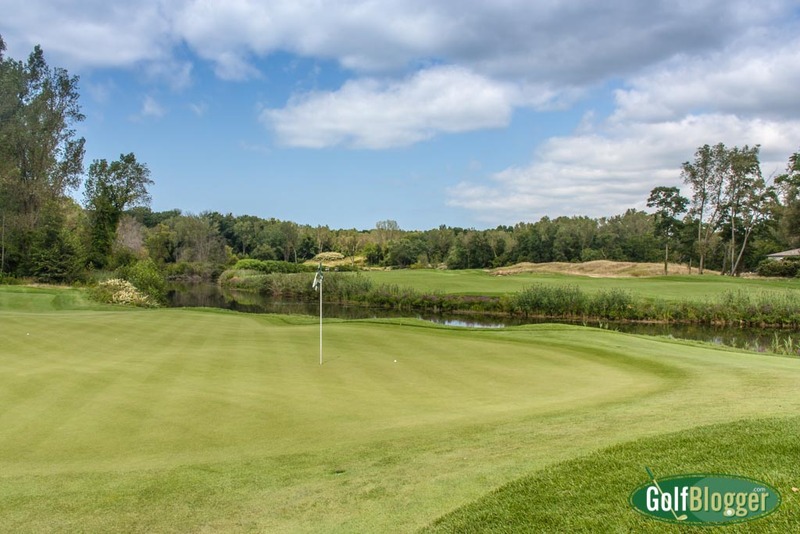 The course opens with a par four and a par three. Then there’s a brief cart ride, followed by a series of four holes. Getting to the seventh requires a long cart ride which crosses a city street. Seven through nine are on the same plot of land, but getting to ten requires another long cart ride. Ten through thirteen are sequential, but another drive is required to get to the final stretch of fourteen through eighteen. Eighteen finishes a significant cart ride away from the clubhouse. I honestly have no idea how a spectator at the Senior PGA could hope to follow a group at Harbor Shores. The distances between segments are such at that players and their caddies must surely be ferried around. In truth, the whole thing is somewhat disjointed. Harbor Shores is a bit like the “Greatest Hits” album of a band that’s been making hits for thirty years. You get a couple of songs from their start, then a few of your favorites from a decade later. Finally, you run into some songs you like from from the end of the band’s career. All the songs are really good, but they don’t really connect, and in the end, all they have in common is the band members that survived. At Harbor Shores, each of the holes is good; some are exceptional. The separation, however, keeps them from flowing. The only thing that really keeps it all together is that every section involves marshland. The other thing that Harbor Shores’ holes have in common are uncommonly difficult greens. A few are just plain ridiculous. Balls landing on the wrong portion of the green might just roll twenty yards away. I three-putted a few greens out of sheer nervousness. Hitting a few inches past the hole could have resulted in disastrous consequences. While Jack Nicklaus could likely do well on these greens, I felt as though they were unfair to the average golfer who managed to get slightly out of position. While Harbor Shores is not particularly long on paper, it plays very long. My playing partners and I always seemed to be hitting the wrong clubs into the greens. From the back tees, Harbor Shores stretches to 6, 852 and plays to a 74.7/143. I played the Grey tees, which come in at 6, 246 and play 70.8/137. Given the way it plays, if I were to go back, I’d try the White tees at 5,740. Hitting a powerful tee shot makes a huge difference on a lot of holes at Harbor Shores. The seventh, for example, is a 436 yard par 4 (337 from the white). If it were flat, or even downhill, that wouldn’t be so bad. But the second shot is at least a club uphill to a tiny green. That means that to have a decent chance at par, a player needs to get into position to hit a nine-iron at worst. Playing from the grey tees (396 yards), I had to lay up with a wedge so that I could take a wedge into the green. The sixth is another taxing hole. From the grey tees, it measures 389 yards. A 250 yard tee shot (well further than the average player hits his drive) puts the player at the end of the upper fairway. At that point, the hole dives down and to the right, over a marsh to the green. On this one, a merely average tee shot forced me to chip to the end of the fairway so that I could take a shorter club to the green. My favorite hole was the par five fifteenth. Measuring 549 from the tips, and 510 from the greys, it starts with a tee shot over a marsh. From there, it helps to know your distances. 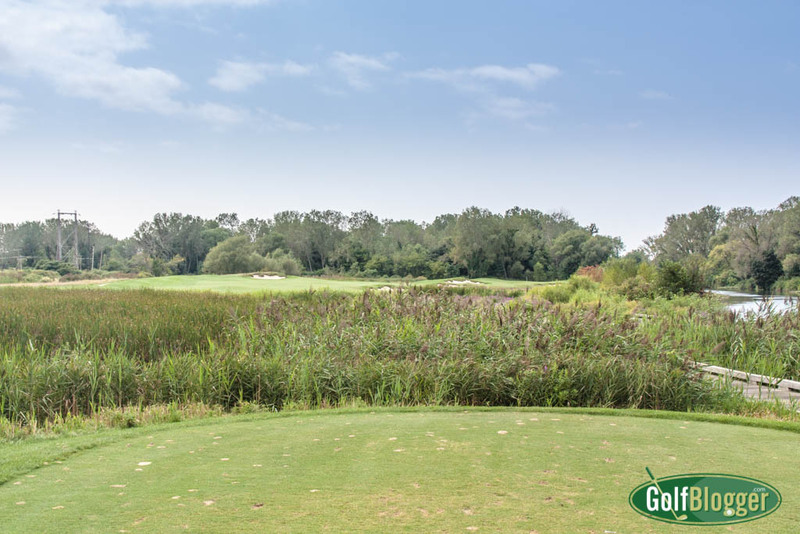 The second shot has to be short of the marsh bordering the Paw Paw river, but long enough for a high shot into a wide, but narrow, two-tiered green. What I liked about the hole is that it forces a player to think seriously about the distance of the second shot. The fifteenth is another example of Nicklaus’ difficult greens. I managed to hit the upper tier of the long, narrow target area. If I was on the lower tier, I think a three putt would have been in the offing. A view from behind the green on the par 4 fifteenth at Harbor Shores. Conditions on the day I played were very good, but short of the best I’ve seen in Michigan. The greens were pristine, but portions of the fairway were beat up. My guess is that the course gets a lot of play and the crew can’t keep up. Harbor Shores Golf Club is relatively expensive at $102 for non-residents during the week and $127 on the weekend. I’m on the fence as to whether Harbor Shores is worth the price of admission. I’m glad I played, but barring an all-expenses-paid trip, don’t think I’d play again. For $30 more, I could play Forest Dunes, which has a better layout, better scenery and better conditions. The golf carts at Harbor Shores were interesting. Each is GPS enabled and has a touch screen panel that provides not only yardages, but other course information such as identifying the location of every cart on the course. It also serves up advertising, though, which I found annoying. I go to the course to get away from the world. The GPS also warns players when the carts are driven too close to forbidden areas. Get too close to the green, and it will first warn you to turn away, and eventually disable the forward gear, only allowing you to back up. It’s not infallible, though. At one point, my cart decided that I was in a “natural area” and wouldn’t let me go forward until I had backed up to the middle of the fairway. In the end, I’m glad that I played Harbor Shores. From the gentlemen greeting players in the parking lot to the excellent grilled shrimp sandwich at the restaurant afterwards, it was a good golf experience. And I think that perhaps, on a second playing from more forward tees, I would find the distances and greens less distressing. But at that price, I can’t afford to go back. The Harbor Shores Golf Club review was first published September 1, 2015. The ninth at Harbor Shores is a 578 yard par 5.